« Listen Live to Irit Rosenblum on Rusty Mike Radio! Two years after his wife died of cancer Nissim Ayish fulfilled their shared dream: To bring a baby into the world. Their baby is the first Israeli to be born from a deceased woman’s frozen embryos through a surrogate. The baby’s Brit (circumcision) will take place in New York on Monday when he will receive the name Nissim and Keren chose for him when Keren was still alive. 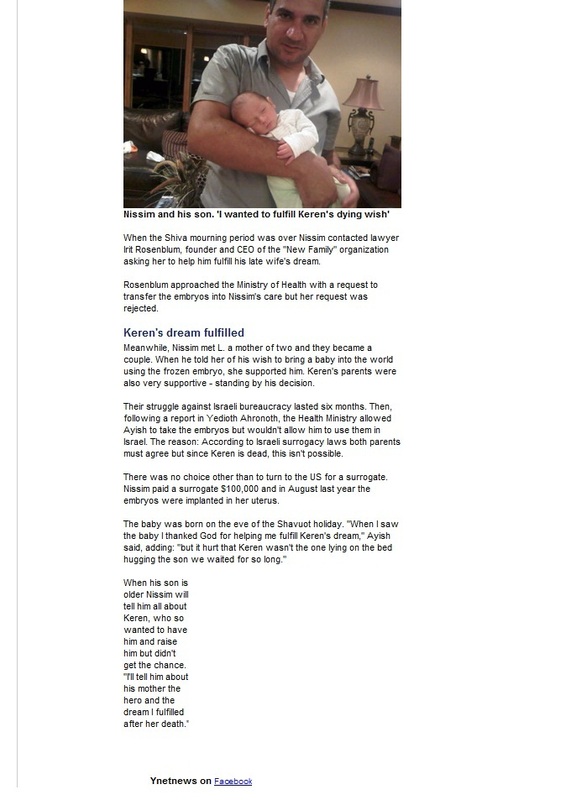 “I’m happy that I succeeded in fulfilling her last wish,” said the new father. Ayish, 42, first met Keren 14 years ago; they were married four months later. “We had many dreams: a house, a family and most importantly, children,” he says. But they soon discovered that Keren was unable to conceive so they started the tough process of fertility treatments. Then in the middle of 2002, their world collapsed – an ongoing headache first thought to be a migraine was diagnosed as a head tumor. The disease put a stop to the conception process though the Rambam Medical Center still had two of the couple’s frozen embryos. Though Keren got the all clear in 2003, by 2007 the wretched disease was back – just as Keren received news that she was pregnant. The pregnancy lasted 13 weeks, but the embryo wasn’t developing properly and she was forced to abort the pregnancy. Keren took the loss very hard but continued to believe that one day, when she will be well again, she would become a mother. Until that day in August 2009: “The doctor called us in and told it was the end,” Nissim recalls. A few days before her death Keren wrote a will in which she gave Nissim her permission to use the embryos. Keren passed away on November 25, 2009, she was 35-years-old. When the Shiva mourning period was over Nissim contacted lawyer Irit Rosenblum, founder and CEO of the “New Family” organization asking her to help him fulfill his late wife’s dream. Rosenblum approached the Ministry of Health with a request to transfer the embryos into Nissim’s care but her request was rejected. Meanwhile, Nissim met L. a mother of two and they became a couple. When he told her of his wish to bring a baby into the world using the frozen embryo, she supported him. Keren’s parents were also very supportive – standing by his decision. Their struggle against Israeli bureaucracy lasted six months. Then, following a report in Yedioth Ahronoth, the Health Ministry allowed Ayish to take the embryos but wouldn’t allow him to use them in Israel. 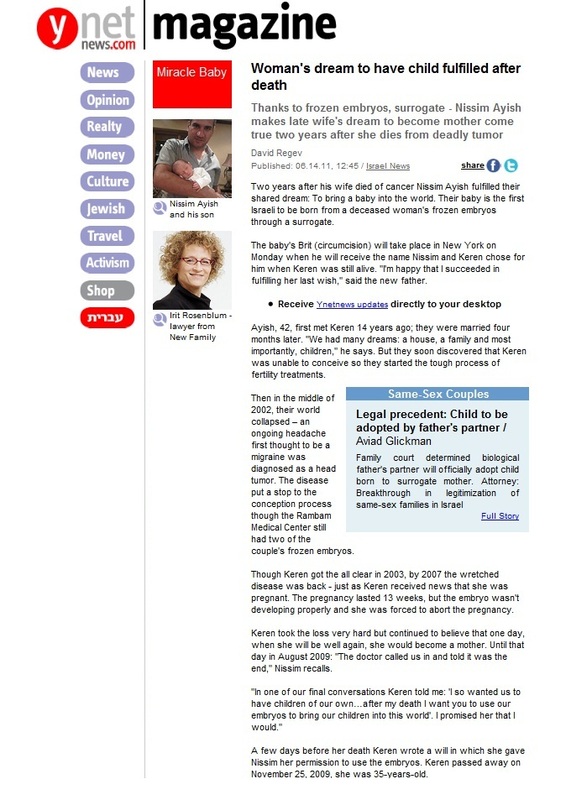 The reason: According to Israeli surrogacy laws both parents must agree but since Keren is dead, this isn’t possible. There was no choice other than to turn to the US for a surrogate. Nissim paid a surrogate $100,000 and in August last year the embryos were implanted in her uterus.